In 1923, in Munich, Adolf Hitler led a putsch (coup d’etat) attempt to take over both the Bavarian state government and the national Reich government of Germany. Shortly after noon on November 9, 1923, about 2,000 rag tag troops set off from the now demolished Burgerbraukeller beer hall. They marched to the Ludwigsbrucke bridge, where they overcame a small police force and continued toward the center of the city. They reached the Marienplatz, where the City Hall was festooned with swastikas, and where they were cheered by a mostly supportive and raucus crowd. Turning right at the City Hall, they headed toward the Odeonplatz, which they never reached. At the Feldherrnhalle, they were met by a large force of police and Army troops. A short but fierce firefight ensued, and 30 seconds later the putsch was over. Hitler escaped that day, but was soon captured and brought to trial on charges of treason. Most Germans, who had viewed the putsch as an incompetent, almost comic, event, thought that Hitler and his Nazi movement were finished. 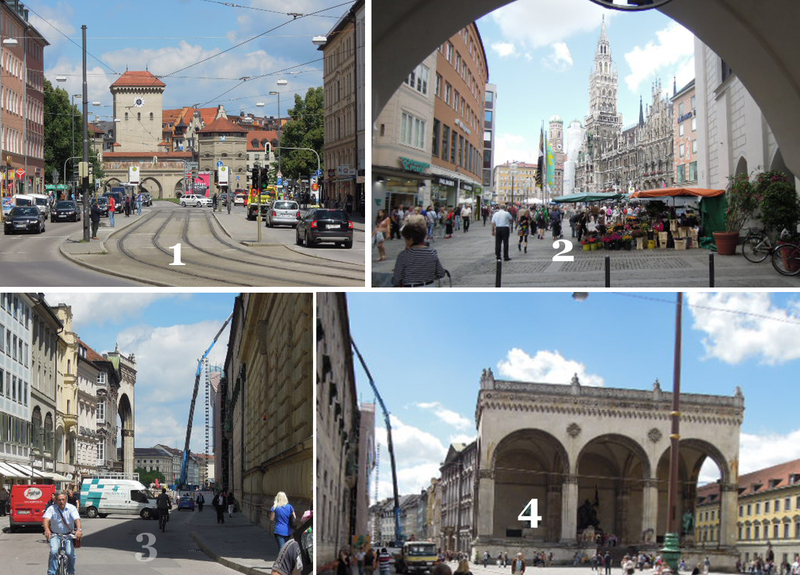 Pictured below are (1) the gate into the center of Munich, (2) City Hall in Marienplatz, (3) the view of the edge of the Feldherrnalle the marchers would have seen as they came down Residenzstarsse, and (4) the view the police and Army troops would have had looking toward Residenzstrasse. Here’s what it might have looked like on November 9, 1923 as Hitler and the Nazis emerged from Residenzstrasse and faced the government troops, just before shots were fired. The events of the 1923 putsch will be portrayed through the eyes of my characters in my as yet untitled novel-in-progress. This entry was posted on June 26, 2012 at 12:07 pm	and is filed under * A FLOOD OF EVIL ... Lew's novel-in-progress. Tagged: Hitler's 1923 putsch attempt, Munich. You can follow any responses to this entry through the RSS 2.0 feed. You can skip to the end and leave a response. Pinging is currently not allowed. The other way aroung: the Nazis met Army troops on the Ludwig’s Bridge, which they crossed because no German officer would have ordered his men to open fire on a group of men lede by Gen. Ludendorff. It was at the Residenzstrasse, by the Feldherrnhalle, that the Nazis found a “large police force.” Unlike the Army, the cops didn’t feel obligued to honor the (real) hero of the Battle of Tannenberg –that’s why they oppened fire. I just want to clarify something: the fact that there were troops by the Feldherrnhalle (obviously there were some) doesn’t mean that they were the first to shoot. In the course of his trial, Hitler himself stated that the shots had come from the cops. 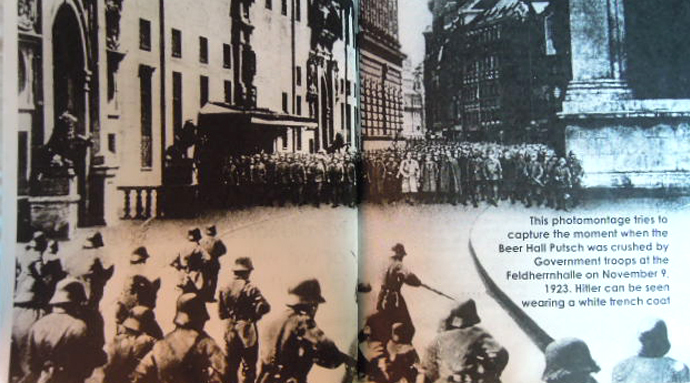 My reading of the history, from several sources, is that there were police at the bridge, not troops, who did not fire, and troops at the Feldherrnhalle, who did fire, probably in response to shots originated from the Putsch marchers. But Hitler is not a reliable source for anything. 1. The Hitler of 1923 was not such an unreliable source as he became later on. Which of one wouldn’t have changed if faced with such an amount of huge responsibilities? No other person in the history of humankind attained such power. 2. It really has NEVER been established who shot first, i.e., who caused first blood. I hope you’ll agree that when irrefutable evidence is lacking, we should rely on indications –and, well, all indications point to the fact that Hitler and the Nazis were not interested during that particular march in creating a violent situation. 3. The photo you provide portrays he facts as “they might have looked like”, not as they actually did, due to which it isn’t entirely reliable. You’re correct that the first shooters have not been identified. But I think it was more likely from the relatively uncontrolled and totally untrained Putsch rabble than the soldiers. When you try to organize an armed march at the last minute, things will probably go wrong. Hitler in 1923 was, from my reading, already a liar whose word could never be trusted. You talk about historical sources, but cite none. The author of “The Rise and Fall of the Third Reich”, William Shirer –one of the best informed writers about the subject, and certainly no admirer of Hitler (or even the German people, according to Konrad Adenauer)– says that it was THE POLICE that shot first, so why do you keep saying that it was the soldiers, why is it so difficult for you to believe it wasn’t the cops? Cops are trigger-happy everywhere –everybody knows that! What you call “totally untrained rabble” were, for the most part, officers and men who had fought with the Reichwher inWW I following their iconic General Erich Ludendoff. Well, of course, the NSAPD organization in 1923 left much to be desired, compared to what it was, say, 12 years later –and even so things still went wrong for the Nazis, thanks in good part to the class prejudice, envy, and actual treason from the aristocratic General-Officer class (can you imagine the American Generals of that time repeatedly trying to kill Roosevelt? ), as well as the influence, clout, and power enjoyed by some of the disloyal people Hitler shouldn’t have relied upon –such as Heinrich Himmler. Like every other politician of his time, both before and after WW II broke out, Hitler was capable of lying, as well as saying the truth –according to their respective “reading of history”, of course –it’s all in the “reading.”. As an individual person, and according to reliable sources, the man could be both absolutely charming, as well as brutally vengeful, for as I say he was a man, a man made of flesh and blood –just like everyone of us. Well, there’s no argument that the party/parties responsible for the organization of that peaceful, kind of “volkish” march were not the same who 13 years later amazed the world by organizing the incredibly beautiful and first modern Olimpic Games in Berlin. Now, if I read you correctly, it was the Bavarian POLICE Chief (von Seisser) who gave the order, and POLICE Lt. (Demmelmeyer) who received it, to “protect” the Odeonplatz, that is, to prevent the marchers from reaching it “at all costs”, with POLICE armored cars and POLICE machine guns. Clearly, no ARMY officer was involved –and that’s my point, that there’s sufficient basis to believe in the probability that it was THE POLICE who caused first blood. As for the lack of organization, the truth is that the march was planned by Ludendorff, not Hitler. Actually, Hitler agreed to it reluctantly, and because –given the situation created by the treason of the three separatist chickens (Kahr, Lossow, and Seisser)– there was no other way to try to free Roehm and his troopers, surrounded by General Seeck’s private army of aristocrats. The German State under President Ebert in 1923 was corrupt; General Seeckt was interested in maintainig the status quo, where the Army had dictatorial powers. Only Hitler foresaw the near future. He knew that the German people were not about to keep taking such crookedness for long, for it was sick and tired of the prevailing unemployment, as well as the fact that it took FOUR BILLION marks to buy a dollar. That situation in a great country like Germany was simply unsustainable. The guys in power, both in Berlin as in Bavaria, were not interested in any great national cause; only in going on lining their pockets.